It is very hard for aficionados to defend the old Wine Bar. It was undeniably dingy, narrow, ill lit, frequently by some outré characters and the wine was very cheap but not the stuff for connoisseurs. I discovered it when a single Burgundy cost sixpence and everyone grumbled bitterly about it. It intrigues me that everyone had a title. There was 'George the Birdman', 'Tom the World Traveller', 'Mick the R.S.M.' and 'High Kicking Lil'. 'The Birdman' sometimes brought his budgie in a cardboard box along and let it out for a fly around. 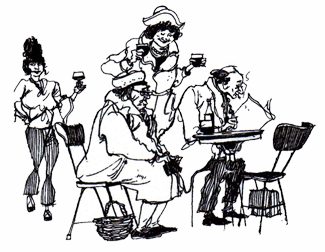 'High Kicking Lil' could high kick her way the length of the winebar when she was near eighty. 'Fred the Dog Man' toured New Zealand with a troup of performing poodles. 'Stream of Consciousness Tom' never spoke two connected sentences and claimed to operate the traffic lights by some method of mind control. I met people who spoke fluent Urdu and another who claimed to have been a chum of Sinatra. Members who travelled overseas sent postcards back to the wine bar where they were displayed along with the framed photograph of Cat -- a black one who lived on the premises, sipped sherry and grew fat on everyones' leftovers. It fascinated a lot of very diverse, interesting people and it horrified a lot more.